In only less than three months in, 2013 is already shaping up to be a pivotal year for Strange Music and the accolades keep rolling in. With Paid Dues 2013 almost upon us, the spotlight is on its organizer MURS, the legendary underground MC who co-founded the festival in 2006. In an interview with HipHopDX about the festival and its acts, MURS couldn’t help but put that shine on Strange Music and Tech N9ne. HipHopDX: You’ve been on tour with Tech N9ne and have had a cool relationship with Strange Music. They represent Paid Dues’ independent spirit. What do you think is the most valuable lesson fans and fellow artists can learn from what they’ve accomplished independently? Murs: Be loyal, be disciplined and have everybody on the team play their role. Travis O’Guin and Tech are great leaders and they run a very tight ship. But they’re also very fair and men of their word. I’ve never dealt with a label that’s been more on point and that’s shown me more love. This is no disrespect [to other labels]. I’ve dealt with Duck Down. I’ve dealt with Warner. I’ve dealt with every label possible, almost. But from major to minor, to indie to underground, Strange Music is the most professional and family-like organization I’ve ever seen. They take care of their people. I see the same faces year after year. They’re good people. I’m friends with everyone from the executive assistants to the guy who drives the truck. I’ve just seen them conduct themselves in a way that no other label does. They have a special place in my heart, and they’re an inspiration. I wish more people knew how they get down, but their success is amazing and they deserve it. That’s not all that MURS has to say about Strange Music, but to read the rest you have to go to HipHopDX.com! 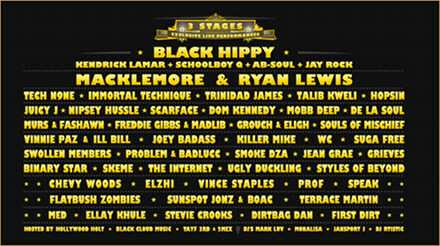 Click here to get your tickets to Paid Dues 2013! What’s your favorite thing about Strange Music?